THE FACTS: Food aid for Venezuela warehoused at the Colombian border town of Cucuta is not contaminated, despite false claims circulating on social media. 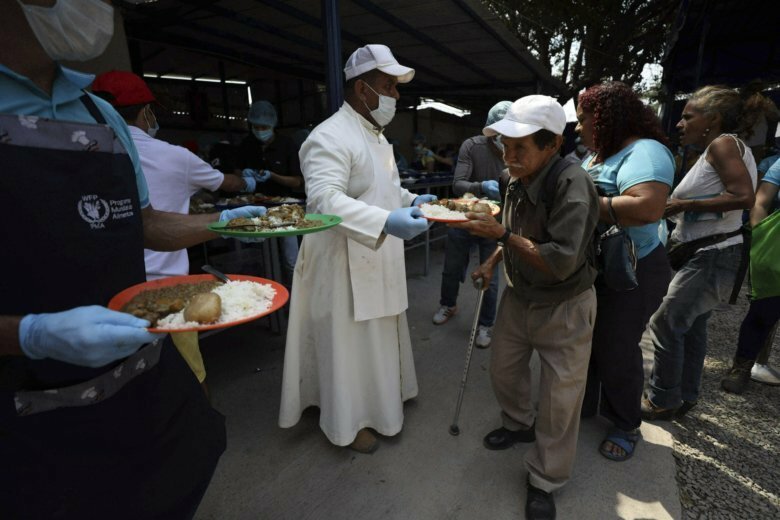 In one instance, a webpage made to look like La Opinion, a daily newspaper in Cucuta, Colombia, falsely claimed that 14 people had been sickened from the emergency food. La Opinion said on its website that the webpage was fabricated. Venezuelan state media also suggested that U.S. food delivered as aid contained harmful preservatives, including sulfur dioxide, which is a commonly used preservative for dried fruits. Cathy Davies, chief executive officer of The Food Industry Employment Program, a for-profit organization that focuses on food safety compliance, told The Associated Press that it has rarely made anyone ill and is not known to cause cancer or have carcinogenic effects. Officials in the U.S. and Colombia told the AP that there have been no reports of contamination in the aid shipments and no reports of illness. Embattled Venezuelan President Nicolas Maduro has called the U.S. aid a “rotten gift” and a ploy by the U.S. to remove him from power. The Trump administration along with dozens of other countries have recognized opposition leader Juan Guaido as interim president of the country, which has been struggling with hyperinflation and shortages of food and medicine for years. THE FACTS: Netflix did not pay Ocasio-Cortez $10 million for a documentary about her run for Congress, despite posts circulating widely online. The posts followed the streaming giant’s reported $10 million purchase earlier this month of worldwide rights to “Knock Down the House,” a documentary featuring Ocasio-Cortez and three other candidates who ran against incumbents in the 2018 midterm elections. Rachel Lears, director of the documentary, told The Associated Press in an email that “none of our film subjects received or will receive any payment for participating in this project.” Lears added that only producers, financiers and filmmakers receive payment from the sale of the documentary to Netflix. The documentary chronicles the campaigns of Ocasio-Cortez of New York, Cori Bush of Missouri, Amy Vilela of Nevada and Paula Jean Swearengin of West Virginia. It recently won the Festival Favorite Award at the 2019 Sundance Film Festival. THE FACTS: A 3-year-old Alaskan Malamute named Donald Trump was not killed in Minnesota over politics, despite misleading social media posts that suggested a Democratic neighbor intentionally shot the dog out of spite. The Jackson County Sheriff’s Office in rural southern Minnesota concluded the person who shot the dog Sunday was “legally protecting their livestock” on private property. A GoFundMe page to raise money for the dog’s owner, Randall Thom, said the dog was shot to death “because he’s named ‘Donald Trump. '” False social media claims that a political feud caused the dog’s death spurred “violent threats” against some county residents, the sheriff’s office said. Thom told The Associated Press he’s exchanged words “about some political stuff” with the neighbor he believes shot the dog but did not think that motivated him to kill his pet. Thom, 59, has attended 46 of President Donald Trump’s political rallies. The sheriff’s office has not released the identity of the person involved in the shooting. CLAIM: Special counsel Robert Mueller’s father was Heinrich Mueller, head of the Gestapo under Hitler. THE FACTS: False facts about the identity of Mueller’s father resurfaced on social media recently after acting Attorney General Matthew Whitaker announced that the special counsel’s investigation into Russian interference in the 2016 election is close to completion. The special counsel and former FBI director is the son of Robert Mueller Jr., a 1938 graduate of Princeton University, who served in the Navy during World War II and worked for DuPont until his retirement, according to the Princeton Alumni Weekly. The 1938 Nassau Herald, the Princeton University yearbook, shows that Robert Mueller Jr. was born in Pennsylvania in 1916. The Office of the Special Counsel confirmed the details. In October 2013, The Associated Press reported that a German researcher claimed to have found evidence that Heinrich Mueller, the highest-ranking Nazi never to have been captured or located, died in the final days of the war in 1945, a few hundred yards from Hitler’s bunker.